Hologram Projector draws attention in at Adipec 2017 in Abu Dhabi, UAE. When exhibiting at trade shows around the world exhibitors are faced with two problems. The first is the expense of shipping in heavy product machinery and the second is generating interest in that product on the trade show floor. For several years not SPX FLOW has solved both those issues by utilizing an interactive 3D hologram projector to feature products they wish to exhibit to clients. The 3d projections are also a great way to draw attention to their booth. 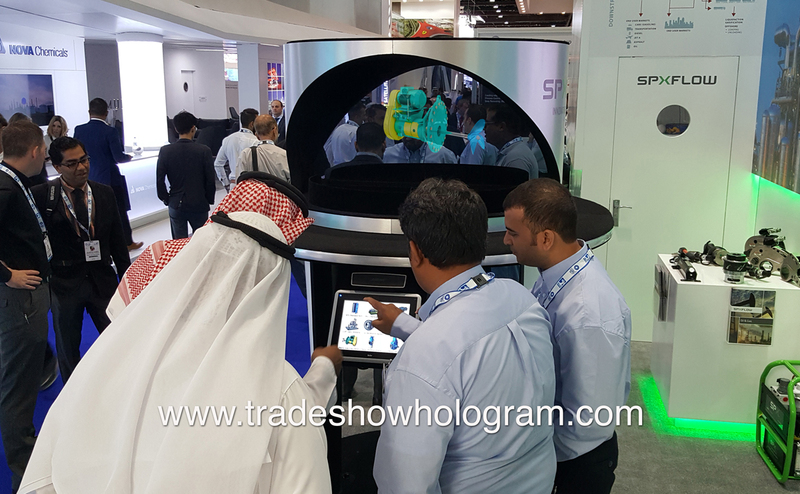 In the photo below visitors to the SPX FLOW booth at Adipec 2017 held in Abu Dhabi, UAE interact with the hologram display. The 3D effect is achieved without the use of any special 3D glasses. SPX FLOW is utilizing 3d Projection Technology to present multiple products at the 2017 Adipec show in Abu Dhabi, UAE. The interactive display created by Trade Show Holograms is capable of projecting 3D holographic video that appears to float in mid air. The display features an interactive touch screen on each side of the exhibit allowing trade show booth visitors the ability to call up any listed product on demand and watch and hear more details regards the featured product. Trade show exhibits are able to use displays like these to both attack attention to their booth with the amazing technology as well as educate clients on their products via the detailed 3D visuals. An interactive 3D Hologram Projector is exhibited at Adipec 2017. 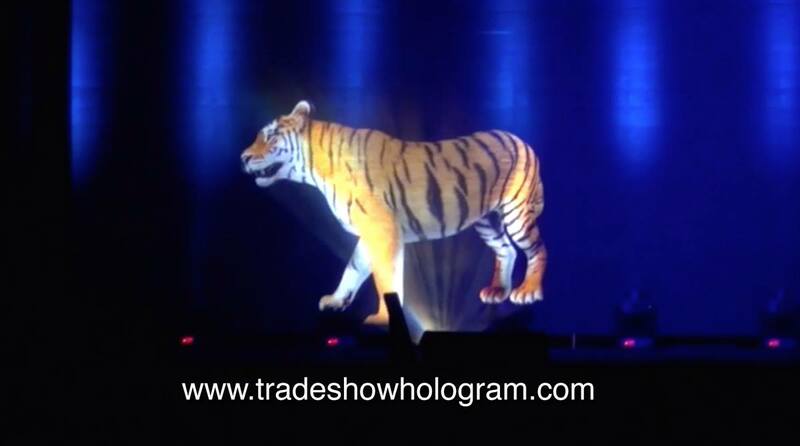 Large Hologram Projector creates life sized 3D Projection of Tiger. A full sized Bengal Tiger appeared on stage at the Santa Clara convention centre via a large scale 3d hologram projector. 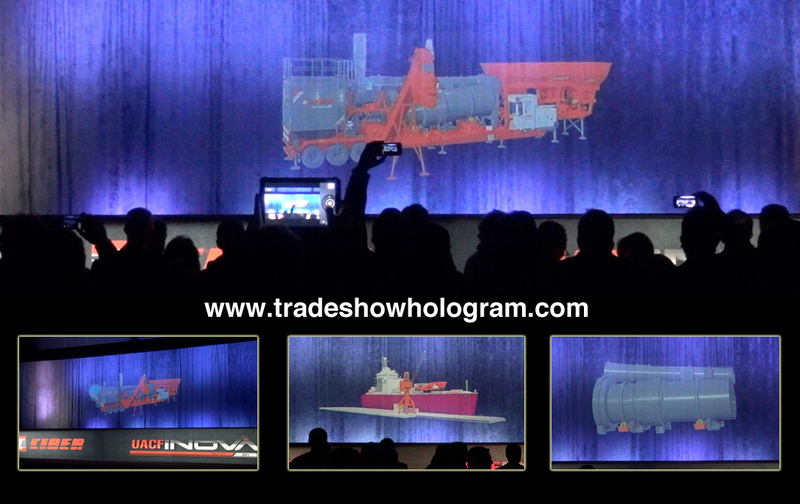 Trade Show Holograms was asked to create the stunning special effect for the opening of a conference. The large holographic Tiger appeared to be projected into mid air in front of an audience of over 3000 people. Life Sized Tiger projected as a 3D Hologram. Trade Show Holograms exhibited their large scale dual sided holographic projector at the SPX FLOW booth for Power Gen 2016. Multiple products were displayed in a 3D holographic form floating in mid air without the use of any special 3d glasses or VR goggles, via the interactive touch screen where booth visitors could call up any hologram of interest with the touch of a finger. The display proved to be quite a success in attracting visitors and leads to the booth. Power Gen 2016 was held at the Orange County Convention Centre in Orlando Florida. At Trade Show Holograms we are always striving to offer clients new designs in 3D Hologram Projectors. Trade show exhibitors are often looking for something new and exciting or something custom that will best fit their trade show booth’s theme or design. A recent client challenged us to come up with something that looked “cool enough that it would look like Apple had designed it.” The goal was to give the holographic projection theatre a more open concept look while still maintaining the special features of an earlier design. The long process starts with our design staff creating 3D models of a design where exact dimensions can be measured and the product tested in a virtual world. The model is inserted into a virtual environment where it can be tested in near show-like conditions. Once the design has passed both that test and also met the physical design approval of the client it is then turned over to our construction shop to figure out how to construct it in both a way that will easily assemble on a trade show floor, transport properly and also closely resemble the original concept image. Trade Show Holograms has created many unique custom designs for clients across the United States and Canada. Original Concept Image and Final Product Photo in a working Trade Show Booth. Visitors to the National Restaurant Associations ( NRA ) 2015 Trade Show in Chicago, May 16-19 were among the first to see Trade Show Holograms new design in 3D Hologram projectors. This latest design projects holographic images up to 3 ft tall with an image width of 5 ft wide, making it one of the larger hologram projectors the company offers for sale and rental in the USA and Canada. 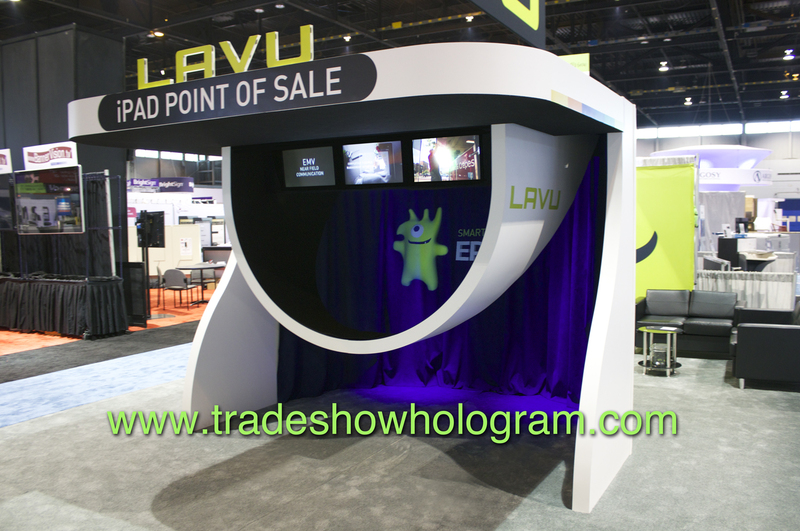 LAVU Inc. utilized the 3D special effect display to both attract attention to their booth as well as provide trade show attendees a fun way to learn their sales message. In this video you can see the 3D presentation as well as content displayed on the 3 additional video monitors overhead of the free floating hologram. CIM 2015 Trade Show sees debut of new 3D Hologram Projector. 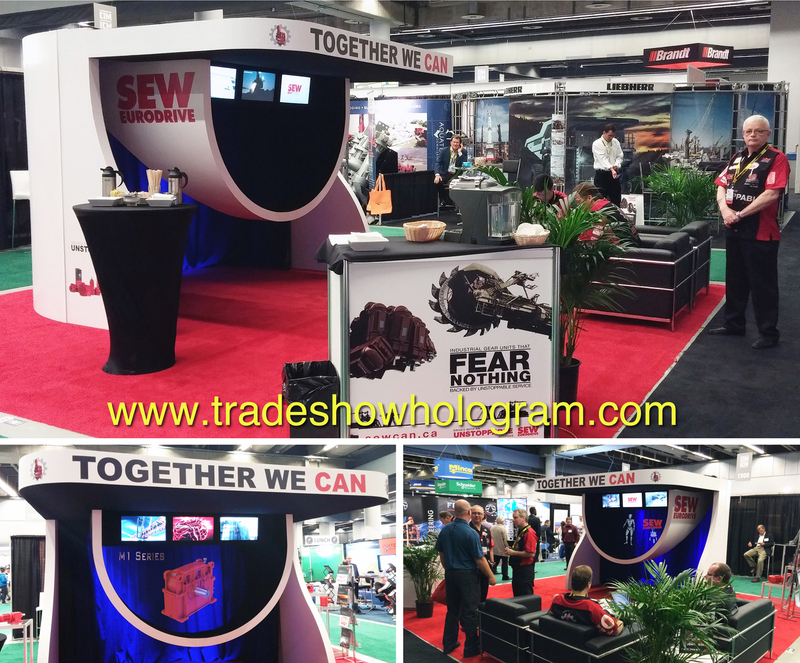 When SEW Eurodrive Canada wanted to make an impression at the CIM 2015 Trade Show in Montreal they asked Trade Show Holograms to design a futuristic looking 3D hologram projection display to attract attention to their booth. The presentation featured Fiona , a futuristic holographic virtual presenter who welcomed guests to the conference. This latest design boasts holograms as large as 3 ft high and 5 ft wide. The special effect proved to be popular with trade show attendees. The exhibit also featured many of SEW’s most popular items in a 3D holographic form floating in mid air. The display also features 3 standard video monitors to display promotional videos that show additional detail related to the product and its applications. Trade show holograms later displayed the display for another client shorty after at Chicagos McCormick Place. The company has specialized in the design, sale and rental of holographic exhibits across the USA and Canada since its founding in 2006. Trade Show Holograms showed off its most recent concept design in hologram projectors at the 2015 National Restaurant Associations show in Chicago IL at McCormick Place. 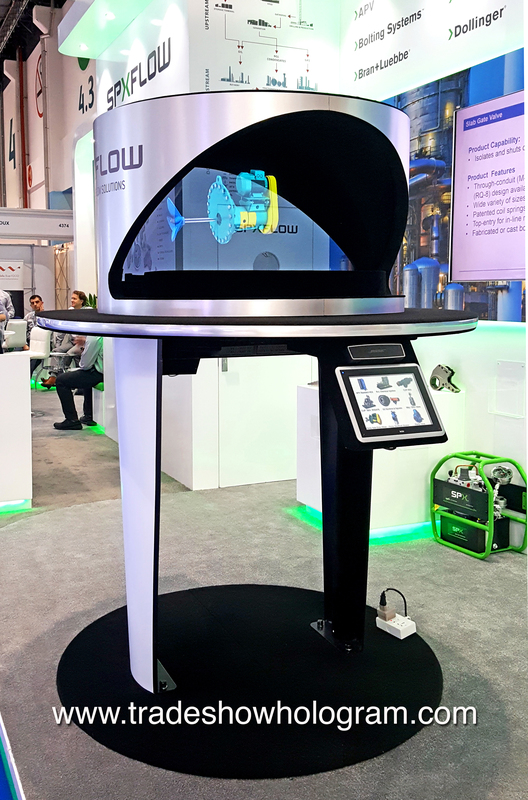 The new open air concept hologram projector features 3 additional regular video monitors to allow a client the option to show more detailed information to trade show booth visitors while the hologram presentation is displayed. LAVU Inc. utilized the eye catching display to draw attention to its newest product line of POV software. Trade Show Holograms has offered a wide variety of unique designs of hologram projectors for both sale and rental across North America. This amazing special effect has proven popular at trade shows drawing added attention to clients booths and delivering the sales message in a memorable way. 3D Hologram projector exhibit at PRSM trade show in Orlando. Trade Show Holograms displayed a 3D hologram projector as part of the NEST International trade show booth at PRSM 2014 in Orlando FL on May 7th and 8th. The 2 minute 3D holographic projection was ” A Huge Hit” according to NEST staff members. Kudos goes to those involved in creating the perfect storyboard layout that allowed our staff to present a visually exciting presentation. In addition to the holographic visuals, action and brilliant colours was the proper blend of sound effects and narration to present the clients message in a manner to make trade show visitors stop and take notice. Holographic kiosks are available for both rental and sales from Trade Show Holograms across the USA and Canada. Victor is a life size holographic trade show robot, virtual presenter and greeter. He recently made his public debut at the 2013 BrainSTEM festival held at the Permimeter Institute in Kitchener Ontario Canada. Victor is part of a new series of holographic presenters offered by Trade Show Holograms. The first prototype is Fiona a female version of Victor. The displays are designed to act as a virtual spokesperson for trade shows, conferences or public events where something special is desired to attract attention. Trade Show Holograms has been designing and creating custom 3d hologram projectors since 2007 and have exhibited them across North America since then. The popular eye catching displays are available for both rental and sale. Life Size Holographic Virtual Presenter and robotic greeter featured at BrainSTEM festival. Victor is a life size 3d holographic projection and virtual presenter developed by Trade Show Holograms. The company has recently released a line of virtual greeters and spokespersons in holographic form. The first in the series was Fiona a female version in the robot line up. Victor was featured at the entrance way to the Perimeter Institutes annual BrainSTEM festival. He instructed guests on how to participate in the show via tweets. The 3D hologram projection appears to float in mid air while making its presentation. The specialized hologram projector can feature a wide variety of other characters, including a clients own speaker or CEO. The CGI nature of the robot allows it to display a wide variety of special effects as well as morph into other display products. The displays are currently available for sale and rental in the US and Canada. 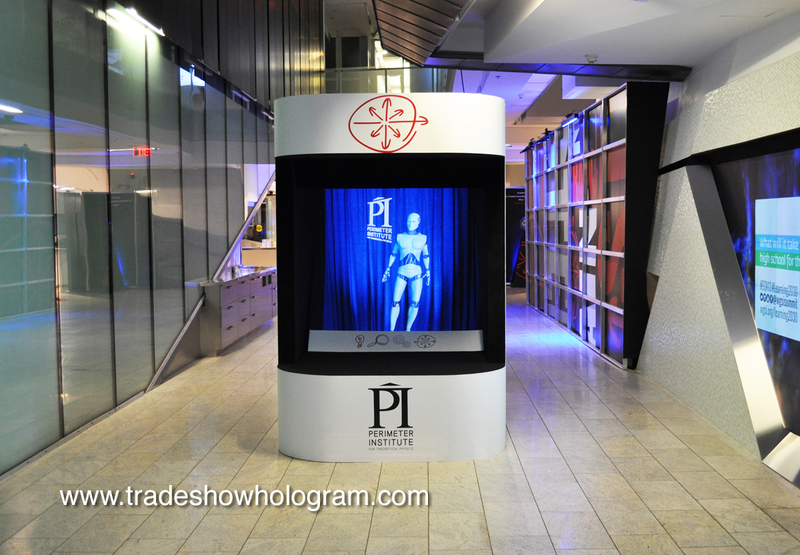 Holographic Virtual Greeter welcomes visitors to the Perimeter Institute. 3D Hologram Projector displays Holographic Images floating in air at Trade Show in Austin TX. Trade Show Holograms recently displayed one of their standard sized hologram projectors at a trade show tent in the Austin Texas area. The event held at the Hyatt Lost Pines Resort and Spa featured new technology in environmental control. The 3D Hologram projector exhibited the highlights of clients product in Holographic form. Holographic images and video appear to float in mid air as if projected into empty space. Holographic projectors are a popular special effect and attraction at trade shows, conferences and media events across the USA and Canada. The display featured here is a standard sized hologram projector that is available for rental or sale. ( custom displays built on request ) Various hologram sizes are available with images ranging from 12 inches high to 8 ft tall. Trade Show Holograms offers hologram projectors that projector both standard and life size holographic projections. The company has been creating custom hologram projectors since it debuted its first hologram at the Las Vegas Convention Centre in 2006 by corporate entertainer Timothy Drake. 3D Hologram projectors create a moving holographic image in 3D and does not require any sort of special 3D glasses. The holographic objects appear to float in mid air. The exhibits are available for both sale and rental and are proving to be very popular at attracting crowds to clients booths at trade shows, and corporate events in Canada and the USA. This large size hologram projector projects an image up to 6 ft wide ( allowing for a life sized virtual spokes person ) and up to 20 ft wide. Large size Hologram Projector projects Holographic Images up to 20 ft wide. A giant, large scale 3D hologram projector was recently debuted to a live audience at a corporate general meeting and conference in the US. Trade Show Holograms created a special extra large 3D hologram for the occasion that offered holographic images up to 20 feet wide. The 5 minute presentation offered a 3D close up view of the companies latest equipment and highlighted its special features. Holograms, both large and small are popular exhibits at trade shows and press conferences across North America. Trade Show Holograms was founded in 2006 buy corporate illusionist Timothy Drake and as offered both hologram projector rental and sales to companies in the US and Canada since then. The projectors prove to be popular crowd attractors at trade shows. The 3D images can be viewed without the use of any 3D glasses.